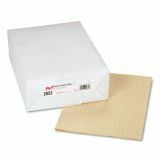 Standard groundwood drawing paper is ruled on one side in squares for graphing and drawing. Note: A minimum quantity of 80 must be ordered, and in units of 8 thereafter. Pacon Ruled Drawing Paper - Quality, ruled, manila, groundwood drawing paper features graphing squares for drawing or graphing. One side is ruled with 1/2 squares. Paper is recyclable."